chalk it up to "great minds thinking alike." I realize most of your products originate from third parties, but it's really tempting for me to imagine this carnival-like think tank full of foodies and food scientists at Trader Joe's HQ—like a cross between Willy Wonka's chocolate factory and that time Bart visited MAD Magazine...like the culinary equivalent of Google. If that is, in fact, what your corporate offices are like, you must hire me immediately. I would prefer your East Coast Headquarters in Boston. Consider this my cover letter. But seriously though, plainness aside, Trader Joe's French Toast might be a viable option for French toast lovers that don't have time to whip up a batch on their own. This product was definitely one instance when the microwave worked better than other cooking options. 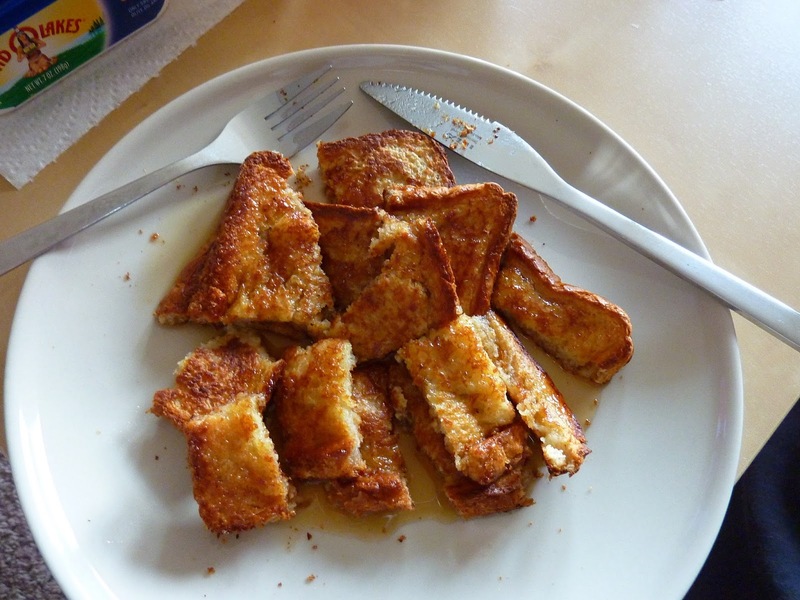 The toaster, though simple and convenient, made the French toast too hard and kinda dry. French toast is better when it's on the soft side and almost mushy. There weren't many weird artificial ingredients, which is always nice, but the product wasn't exactly bursting with flavor in my opinion. Butter and syrup definitely helped, although it's still not the best French toast I've had. But we can't be too hard on it since it's pre-packaged and can be ready in a few short minutes. I think in this case, we're looking at 3.5 stars from Sonia and 3 stars from me. 6.5 isn't a terrible score. Don't be too hard on yourself, Big Joe. We still love you. How much do we love you? We love you 500 posts worth. That's right, the team here has collectively posted 500 different reviews, often reviewing two or more products in one article. Don't believe us? Go ahead and count 'em. We probably would have given up long ago if it weren't for you, our faithful readers. Thank you so much for your input, comments, shares, likes, pageviews, and follows. Got very excited when I saw Dark Chocolate Covered French Toast, Pumpkin French Toast, etc. then realized were gently urging Trader Joe's to come up with same. Plain old French toast— like scrambled eggs— is incredibly easy to make and so much better than anything frozen you can buy. Hopefully TJoe's reads your post and follows through. Totally, Michelle! 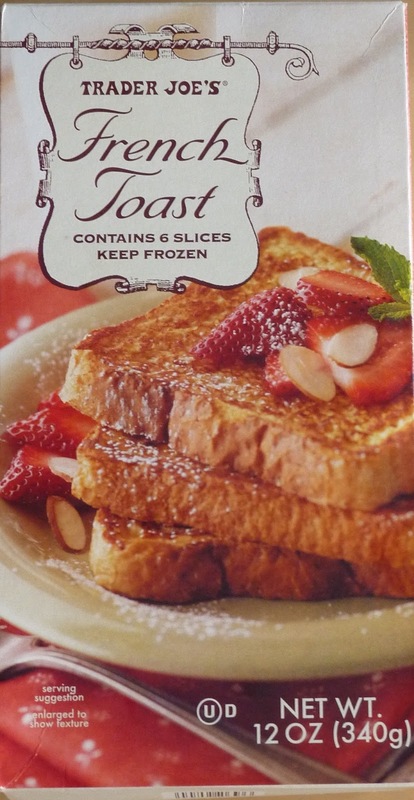 This frozen French toast isn't bad, but it's no substitute for homemade. That means a lot, Tammy! Thanks! I love your blog! Keep it up! "It's temporarily out of stock." -Trader Joe's. Translation: "It's gone from the universe forever." Unlike Shauna, I tried the chocolate stuffed french toast and hated it! On a dinner note, you should definitely see if you can find chicken gorgonzola (in the freezer section), or chicken medallions with coconut red curry (in the refrigerated meats section). The chicken gorgonzola has been my favorite meal for awhile now, but the curry might have taken that place after I tried it tonight. Wow!! Thanks for the rec. I'll look for those next time! Congratulations on the 500th post! I love this blog. You guys are so silly. I love TJ's too and I've totally adapted an "experimental' approach with my shopping there, thanks to this blog. A couple of Fridays ago, drunk with payday lunch money power, I went into TJ's and purchased 3 stinkers! I believe they were (now, don't judge me. I was hungry, lunch was late, and I had a pocketful of cash) TJ's sushi (Siiigh I blame myself for this. I should have known better), some sour cream and onion corn puffs, (a big bag of flavorlessness) and a Toblerone just because I've never had one before (too sweet! used it a week later to make brownies). But 'twas all in good fun. Those are the breaks. ;-) Keep up the great work! Thanks for the info, tiga! I know Russ took a look at those puffs a while back and he wasn't super enthused either. We appreciate the congrats and, of course, ALL of your wonderful comments!